Though they may seem like unlikely companions, both Iceland and the Basque Country undertook unique democratic regenerations following the 2008 global economic crisis. Iceland - an unusual companion to the Basque Country? Flickr/Coldpix. All rights reserved. Contemplating about Iceland from the Basque Country could be seen as a remote exercise, even more so when it refers to carrying out ethnographic fieldwork. This is exactly what I attempted doing my second visit to Reykjavik on the 23rd to the 29th of September 2013. I was already familiar with Iceland - its peculiarities, remarkable language, music, literature, filming, and even its celebrities. I have connected not only by my scientific curiosity, but also by my emotional - even spiritual - sensitivity. Emotional landscapes can travel quickly from remote places: from the volcanic and resilient smallness of Iceland to another tiny complex and diverse corner between Spain and France, the Basque Country. I am Basque - yet I write my surname with a non-Basque letter ‘C’. I have been ‘touched’ by Iceland as a whole piece of outstanding isolated ‘whiteness’. Similarly, even though I have been in Iceland separately in the past – 2007 - having the same scientific purpose as in 2013, I was impressed and shared my hypothesis on how the language, landscapes, and the most charismatic asset of the island, its people, have something to do with my homeland, the Basque Country. Seemingly, we can dare to link Basques and Icelanders regarding the smallness of territory, the relationship between Basque whalers and Icelanders and even our ‘unique’ languages. However, despite the historical links between Iceland and the Basque Country (Edvardsson and Rafnsson 2006) dating back to the sixteenth century, I have not found any published comparative study in my research fields about contemporary Iceland and the Basque Country. As Jón the Learned conveys in the Spánverjavígin saga, the relationship between Basque whalers and Icelanders reached a tragic peak in 1615, when approximately 30 of the former were slaughtered in the region of the West Fjords. However, they are two societies that may benefit from connecting with each other. They are struggling to depart from a crisis that is more than financial, and they need to readjust their governance systems to the changes in the last few years. Both require a deep democratic regeneration. Like the Basque Country, Iceland also after struggled after the 2008 crisis to rise above its predicament. Iceland was the first country hit by the 2008 financial crisis with dramatic democratic consequences. The source of the crisis was mainly the financial collapse that left the country with no credit, and in a socio-economic emergency. I focused on the source of the crisis and the way Icelanders explained the causes and the ongoing process to overcome it. I sought to answer the following question: If there has been some democratic social innovation or regeneration in Iceland after the crisis, what relationship does it have with ethics? What is its moral core? With the Basque Country, the ceasefire announced by ETA in 2011 led to overcome the lack of peace and deficient normalised political or institutional life. In this globalised context, both countries required to restructure their governance systems to adapt them positively. In the two cases, the democratic regeneration was the outcome by having similar ethical and political implications. They shared some features concerning their comparative small size and identity (unique local language and culture dealing with the bigger player in a global arena). I wondered whether some of the transformations (e.g., social innovations) that emerged in Iceland during the Kreppa years (2008-2013) could apply to the crisis in the Basque Country in the new post-violence situation (the ETA’s ceasefire from 2011 onward). In addition, could we suggest micro-social innovative cases such as cooperativism or plurilingualism, among other features? 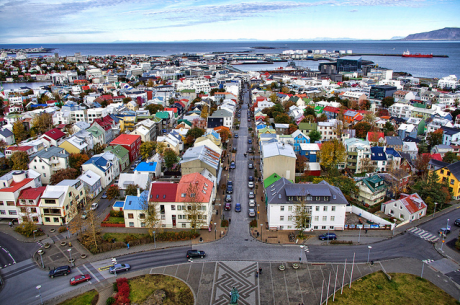 As different as Iceland and the Basque Country are, both situations involved hope for a regeneration of the democratic system, and both raise questions such as: What has really been happening in Iceland? What is the nature of the change or innovation that has emerged? In what way is it special or different from the Basque case? First, I wanted to make clear the underlying ethics (presuppositions, emerging topics and emotions) and strategic critical social innovation trends (social networks, economic solidarity and contested anti-neoclassic economic orthodoxy initiatives) around themes such as the political innovation at the global and local scales. I was also interested in the meaning of the crisis and its impact on democracy (before and after 2008), the influence of technology and social movements in this hypothetical social transformation, and the role of different stakeholders and the macro and micro socio-economic real alternatives in contrast with the neoclassical economic orthodoxy agenda. I also wanted to examine how we could connect the Basque and Icelandic cases under this similar thematic umbrella. Second, I wanted to reconnect not only Icelanders and Basques through our two political systems, but also apply ethics and critical social innovation to our comparative research project. As Hoeg (2005) stated, ‘There is only one way to understand another culture. Living it’. Trying to make my hypothesis precise, I set up a research agenda and design an intensive fieldwork in Reykjavik by using the qualitative, semi-structured method. I interviewed eight discussants, mainly academics but also policy-makers and politicians. Instead of presenting the entire methodological process and the specific conclusion about this research project, I aim to conclude this ethnographic chronicle with a summary in which I draw on the main suppositions of my research. 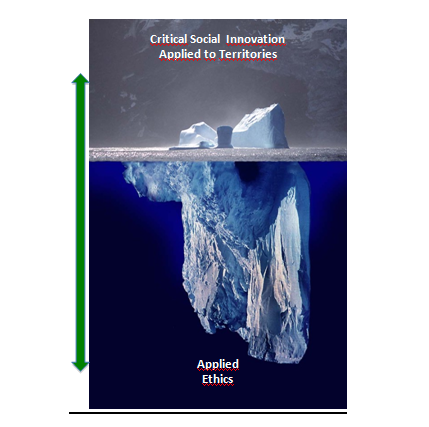 The specific content of this research will undergo publication entitled Demos-Ethos: A framework to study the Basque and Icelandic cases through Critical Social Innovation and Applied Ethics shortly in the Innovation: The European Journal of Social Science Research. According to the Financial Times (09/27/2013), Iceland seemed to enjoy ‘abundant natural resources that even the most over exuberant financiers and politicians could not damage too much’. At present, this statement is fair and true after the 2008 crash. Iceland’s material, spatial and economic system (URBS), proved the country was well balanced and ready for any unexpected vulnerable circumstances. The crises mainly hit Iceland but its reaction was quick by keeping the main economic factors in favour of the solution. Indeed, sustainability and well-being were the main structural factors in the regional development policies. In addition, being small and resilient made Iceland stronger by having such a well-connected territory between the hub (Reykjavik) and the periphery (Akureyri, Kópavogur, Harnarfjördur, Keflavik, and others). Some of the sources to overcome the crisis and settle down the economy were the real microeconomic recovery sectors, such as fishing and tourism. Iceland’s physical, digital and social connectivity systems (CYBER) were the dynamic and modifiable ‘liquid’ artefacts. We cannot forget the spark the ‘kitchenware revolution’ propagated through social media such as Facebook. People demonstrated a collective defence of the means for happiness and social well-being by network-driven, new communitarian social reconfiguration. It should be also noted that digital connectivity and the physical proximity between culturally diverse peers enabled a socio-political new agenda and situation by presenting a social capital that still exists to date. Iceland started partially regenerating its political structures mainly due to the outstanding usage of the physical, digital and social connectivity as a response to an emergence. Iceland’s citizenship, entrepreneurial and migration systems (CIVITAS) depicted an emotionally well-channelled activism. To face the massive threat of collapse, people self-managed and organised a civic level activist survival strategy; a Pots and Pans revolution in the streets was the main example. In addition, it should be added that in contrast with the Basque case, in Iceland, citizens channelled their collective anger without violence, and enabled public deliberation. Streets were synonymous with the public space to protect the basic rights of the citizenship. From the social innovation perspective, the transition from activism towards entrepreneurship did not proceed by being in jeopardy. Citizenship assumed the responsibility of contributing to the financial ‘bubble’. Iceland’s political system changed dramatically before and after 2008 due to a massive dissatisfaction with the conventional political system (POLIS). Therefore, the outcome of that context was an internal political fragmentation in permanent and ongoing transition until present days. It is noteworthy that the confrontation between the declining dominant mass media, and the alternative social media-driven politics, was produced in this transition. Social media became the collective intelligence of ‘togetherness’ after a fragile, broken democratic system. The transition fostered a permanent celebration of cultural diversity by entertainment politics without populism. However, among the celebration and the victory, there was a new civilian principle: ‘Lack of impunity and zero tolerance when trust or social capital is broken’. Therefore, by presenting dilemmas in the political transition, Iceland has been inside its own tunnel in an ongoing re-examination. Nowadays, the process, not yet closed and culminated, shows a national identity based on independence, modernity and uniqueness. There is myth already perceived as the ‘Icelandic miracle’, in reference to how a revolution transformed a bankruptcy by forcing it to a point of reversal. This set up a new critical order with permanent contestation, but also caused uncertainty and fear of a constitutional reform due to lack of consensus. Finally, this delicate and opened context leaves a pending question for Icelanders that could be named ‘the European dilemma’: can Iceland retain itself within the EU context without any institutional protection? This is a pending question for Iceland as a small state that provides hints to the Basque Country, another city-regional small nation that faces a future path by being as small as Iceland. For the last part of my fieldwork research in Iceland, we went to Thingvellir. It is said that the first parliamentary assembly in Europe took place in a region called Thingvellir, in southern Iceland (the so-called Althingi). I confess it was the perfect ending as to contemplate how the Basques and Icelanders already connected throughout their democratic recovery ties. Moreover, in Thingvellir, as viewed from the Basque perspective, Auden described Iceland as depicting three kind of landscapes: ‘Rocky, very rocky and completely rocky’. * Thank you Iceland, the hospitals are painted in white (still) because of you.